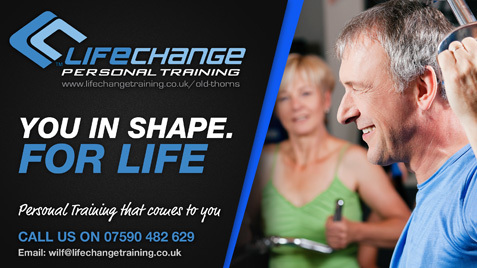 *Wilf offers £5 off the above session rates when taking 2 plus sessions a week - terms apply. Briege - "Wilf's is the best personal trainer I have ever used because he is encouraging, fun and knows his stuff. Both his ladies fitness camps and the one to one training I have used have helped me feel stronger, fitter, more energetic and has enabled me to also have a completely injury free hockey season - thanks Wilf." Craig & Ali - "We have made a huge improvement, we used to say were fairly fit. Now we are fit and look back and realize we used to be unfit. Wilf has really helped us and it is fun." Simone - "Wilfred's guidance and encouraging nature ensured I stuck to the exercise plan even on the difficult days. Not only did it assist with my weight loss but my confidence too." To make sure you have the best possible foundation for any personal training, Wilf follows this simple but effective 3 step process. This ensures, wherever you are starting from Wilf can get you moving towards your goal as quickly and efficiently as possible. Via a Kinetic Chain founded assessment; I will attain an accurate picture of the strengths and weaknesses of your body, and the corresponding factors which need to be addressed. On the foundation of your Kinetic assessment I will develop the most effective, progressive program for you to achieve your desired target within any restraints life may hold – be it time or financial. I will get you started on your program, whether you are continuing to work with me or if I have set you up ready for success - making sure you are 100 % happy and clear in what you are doing and why. Mark - "Wilf's sessions have been brilliant - fun, but challenging and progressive. I wouldn't have reached the summit of Mont Blanc without the fitness and stamina achieved via Wilf's physical training and coaching!"